The Halal cart crew: Ansar (left) and Collado (center) with three employees. Photo by Allison Braden. In Manhattan, halal carts have become an institution — staples for late-night carousers. 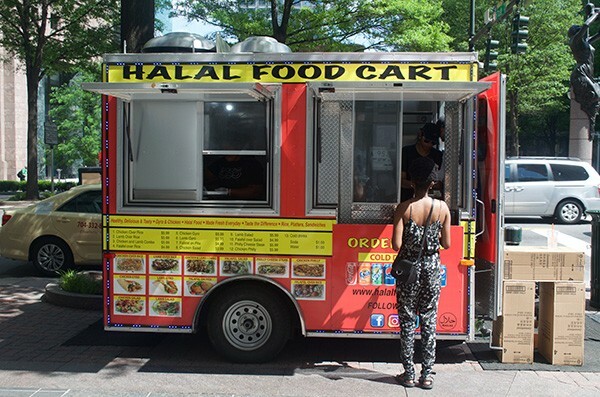 But many Charlotteans don't even know what a halal cart is. 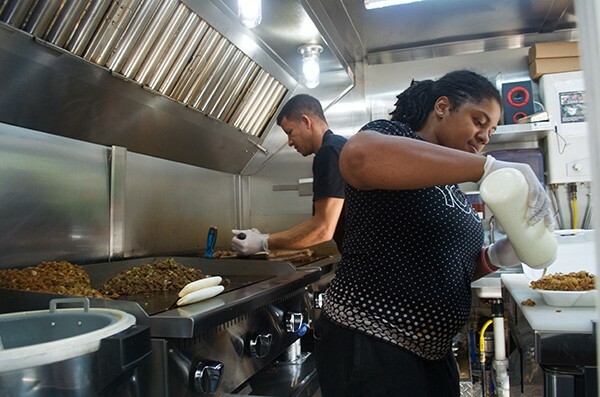 The mobile food stands, modeled after those that traditionally sold hot dogs or tacos, serve up a combination of tasty dishes from the Muslim world, but with a New York sensibility: rice, greens, and halal meat either in a foil dish or in sandwich form. 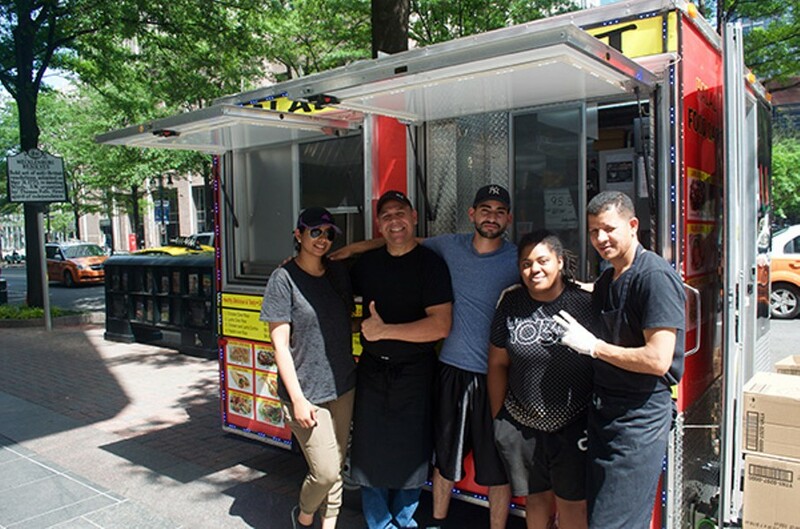 As America celebrates its 241st birthday on July 4, Charlotte's first-ever halal food cart celebrates its first year in business at a corner of the city's oldest intersection, Trade and Tryon streets. Owner Khuram Bashir, a Pakistani native, moved to Charlotte from Long Island, N.Y., about five years ago. When I asked Bashir's stepson, Cristopher Collado, 23, why the family wanted to open a halal cart in Charlotte, he answered simply enough, "We were hungry. We wanted our own halal food." Bashir's sister, Bisma Ansar, 23, chimed in. "We loved halal food back in New York. I would have it all the time. It's new here. A lot of people from New York live around here and they love halal food." "Halal," which translates from Arabic as "permissible," means that the meat is butchered and prepared according to specific tenets of Islam. Many Muslims eat halal meat exclusively. Collado likens it to the relationship between Jewish people and kosher meat. The meat is always halal inside the Charlotte cart, but the dishes vary. Options include the classic chicken over rice (a personal favorite) or lamb and chicken over rice as well as gyros, falafel and Philly cheesesteaks. The dishes are culled from the menu at the family's 4-year-old Matthews restaurant, Mi Barrio Halal Latin Grill. Bashir's wife Damaris moved to the United States from the Dominican Republic, and both the restaurant and the food cart feature an unusual blend of international flavors. But when I asked Collado if he considers the cart's food to be a Latin and Middle Eastern fusion, he calls it something else: American. "We just say it's American, because only in America could you bring all parts of the world together. It's a beautiful thing," Collado said. "When you see the employees — the people that work with us — it's from all parts of the world. You have a guy born in the U.S., a guy born in Egypt, and a guy born in Venezuela, so it's all parts." A customer waits for her lunch. Collado moved to Charlotte from New York City about a year and a half ago, when Bashir called to let his stepson know the halal cart was finally going to happen. The permit process had taken a long time — three years. The delay was, in part, Collado said, because the cart is unusual in size: bigger than a pushcart, but smaller than a full-size, driveable food truck. When the permit finally came, the news was even better than expected. The city had placed the cart at the intersection of Trade and Tryon, the heart of Charlotte. When his stepfather called to give Collado the news, he moved down to help. Bashir and his family opened the cart for business on July 4, but success wasn't guaranteed. "We didn't even know how to set up our cart," Collado said. Another challenge involved confronting preconceived ideas about Islam and halal food. That became clear on the first day of business. As Bashir struggled to get the cart operational, part of it fell. Bashir rushed to catch it and he fell, too, scraping his elbows and knees. It was then that Sam, a local who regularly proselytizes at the intersection — you might recognize his booming voice as the one screaming "Jesus Saves" at all hours in Uptown — "jumped into action," as Collado put it, to help his stepfather. According to Collado, Sam had already resolved to ignore the halal cart and never eat the food there because of its association with Muslims. When Bashir offered him food in gratitude, Sam was reluctant. "They got into a conversation and they realized that we're all here with the same purpose," Collado said. "We all come here and we all die and we all have to figure it out. Afterward, he tried a gyro and said, 'That's the best gyro I've ever had.'" And what makes the food so good? Collado said the secret is in how fresh the ingredients are. In New York, he said, there are so many halal carts that the market is saturated. Not every cart gets enough business to keep their inventories fresh. "We get a lot more business [in Charlotte], so the food we put out is fresh," he said. In Collado's opinion, the famous halal cart white sauce also has something to do with its success. The family makes both their white and hot sauces at home. There's also the personalized service. "You gotta treat it like it's for yourself and that kind of pushes you forward," he said. Employees cook up some delicious halal grub. Photo by Allison Braden. I asked Collado and Ansar if they feel like they're giving Charlotteans an authentic New York City experience. "I honestly think we're a little bit better than New York," Callado said. He also enjoys working in Charlotte more than New York. "Over here, my rudest customer considers me more than my best customer in New York," Collado said. Ansar added, "It's nice here. It's quieter. You know, New York is hustle and bustle. The crowd is better [here]. People are nice. There's a lot of competition over there. Over here, it's a new concept." In their line of work, Ansar and Collado encounter Charlotteans of all stripes. It was lunchtime on a weekday when I stopped by, and the cart was surrounded by clean-cut lunch breakers, but at night it's another crowd altogether. The cart stays open until 2 a.m. every day except Friday and Saturday, when it serves until 4 a.m. The hours make the halal cart one of the only late-night food options in Uptown. Bigotry has not gone unnoticed at the halal cart. The diverse crowds have included the occasional xenophobe who might make a comment to the employees about "going back to their country." But Ansar emphasized that it is rare. On the whole, she said, Charlotteans seem to have taken well to the new concept. "People are very accepting of it. They like the idea of the food, and they like the concept of halal food," she said. "They come and ask us, 'What is it?' and they'll get it. We appreciate that they accept us and accept the whole concept." As the business approaches its first year, Ansar is appreciative of that acceptance. "We love the people that come to the cart and talk to us and who really like the food," she said. "Without them, honestly, we wouldn't be here." Both inside and out, the halal cart brings people together and facilitates a uniquely American fusion of ideas, flavors and cultures. The conversation among the cart's employees is a mix of Spanish and English. On a hot afternoon, the employees deftly move around each other and skilfully dice meat on the sizzling cooktop. Ansar took orders through a small screen window (cash only). Outside, Collado pulled icy cold sodas out of a cooler. When I visited, the halal cart shared the intersection with a taco truck and hot dog stand, making a trio that felt very American. Collado pointed to the American flag on the side of the truck and said the mix of cultures and people "really is what makes this country great." On that first hot July day in business, the challenge of getting the cart set up may have seemed an inauspicious sign, but Bashir's encounter with Sam seems almost symbolic. Their first meeting was marked by wariness followed by a willingness to put differences aside to step in on behalf of a fellow traveler. That moment of connection grew into an abiding friendship that transcends their religious affiliations. "That's what it's all about," Collado said. "Bringing us together." Besides, he added, "Who doesn't like food? Food always brings people together."